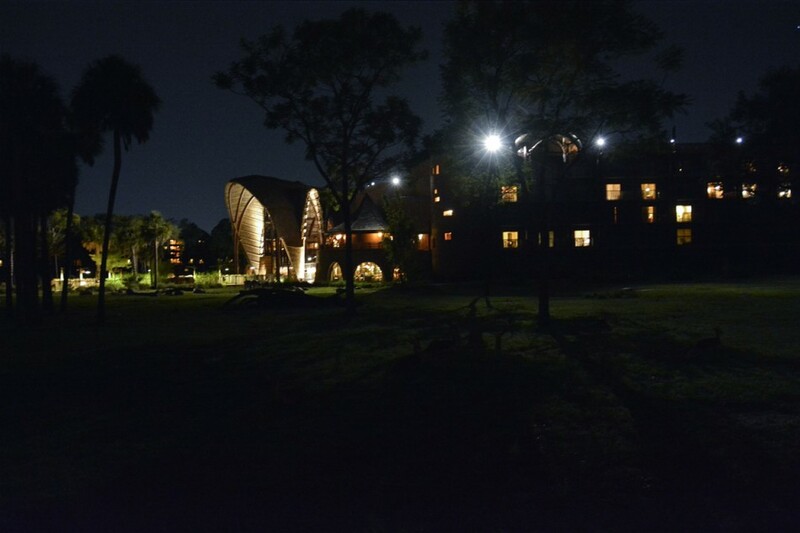 Disney’s Animal Kingdom Lodge offers three different safaris to guests staying at the lodge and villas: the Sunrise Safari, the Wanyama Safari and the Night Safari. 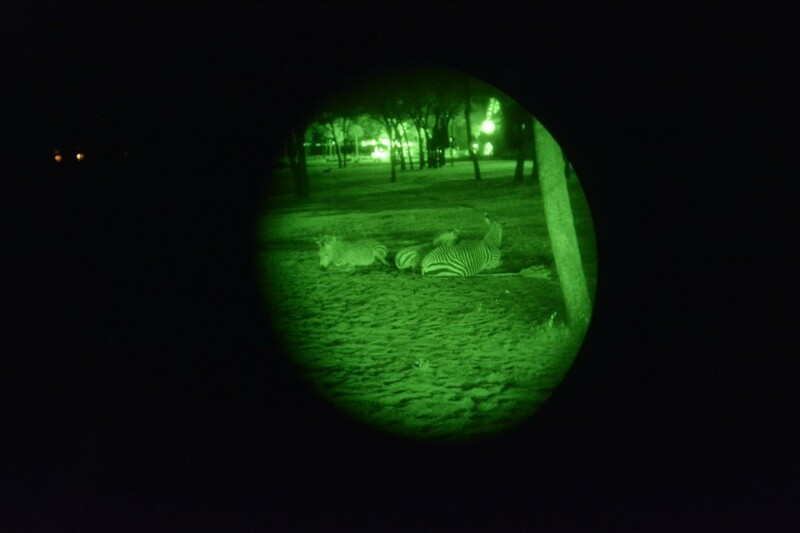 On Saturday I had the pleasure of taking the Night Safari so that I could tell you about it. We met at Sanaa at 9:45 PM for our tour that was to begin at 10 PM and end at 11 PM. If you plan to do this tour, be sure to be on time. Once the truck takes off, you’ve missed it. At the check-in we received a glow-in-the-dark bracelet that we placed on a light to charge. It was kind of cool, but unfortunately, it lost its charge within minutes. 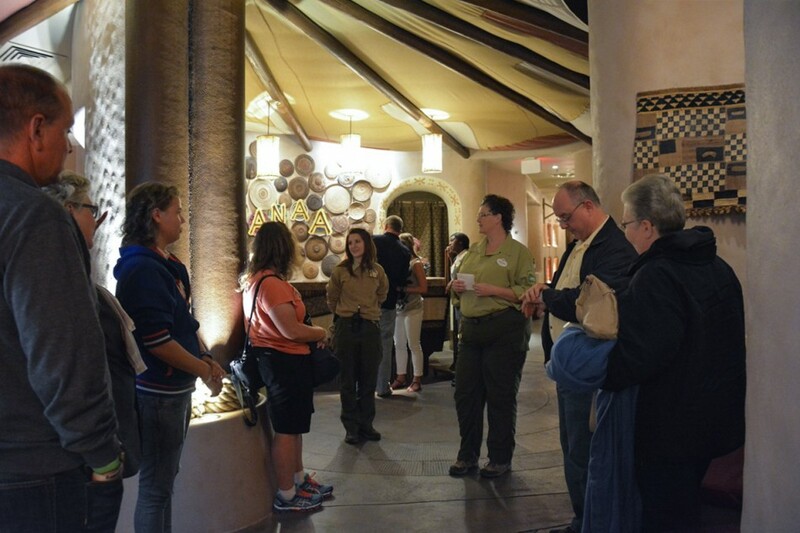 Two Animal Programs Cast Members met us at Sanaa. They were Emily and Heather. 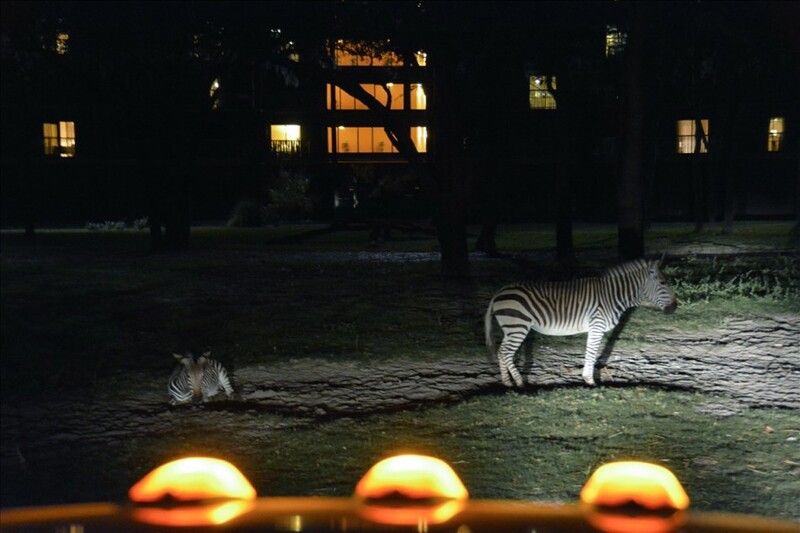 From there we walked to the main entrance of Kidani where our safari truck and driver, Gretchen, awaited. 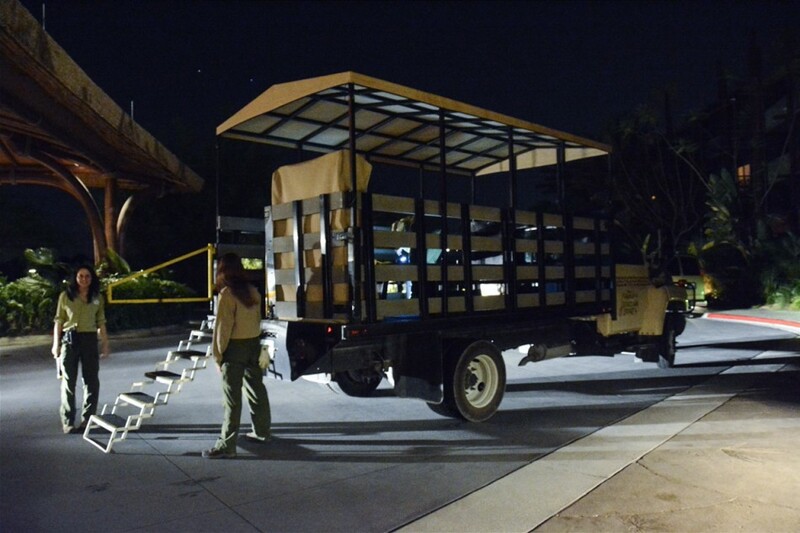 The safari vehicle is an open flatbed truck with a slatted rail, cushioned bench seats, and canvas top. We entered via some fold out steps in the rear. 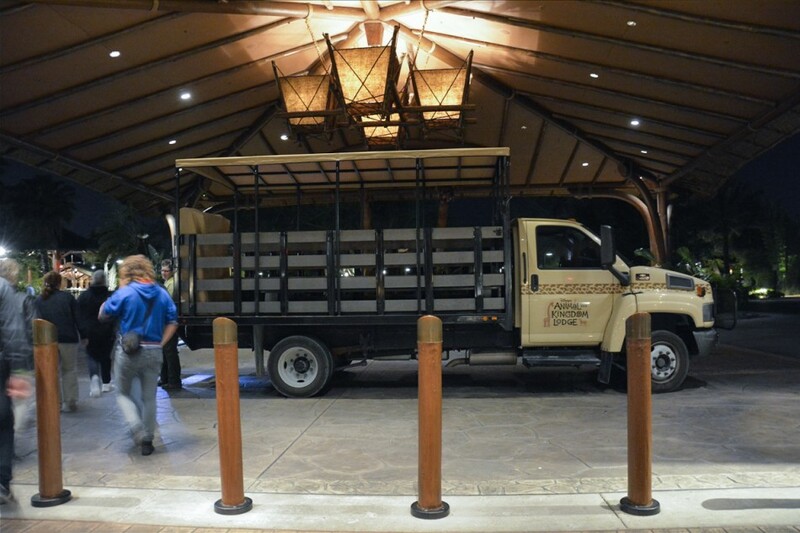 The vehicle does have a lift to accommodate guests using ECVs or wheelchairs, however, you must be able to transfer to the bench seats as the wheelchair or ECV cannot remain on the safari truck. The seats don’t have any kind of restraint and it is a bumpy ride, so keep that in mind when considering if this tour is for you. Although the truck is covered, be sure to dress appropriately for the weather because if it rains, you will get wet. 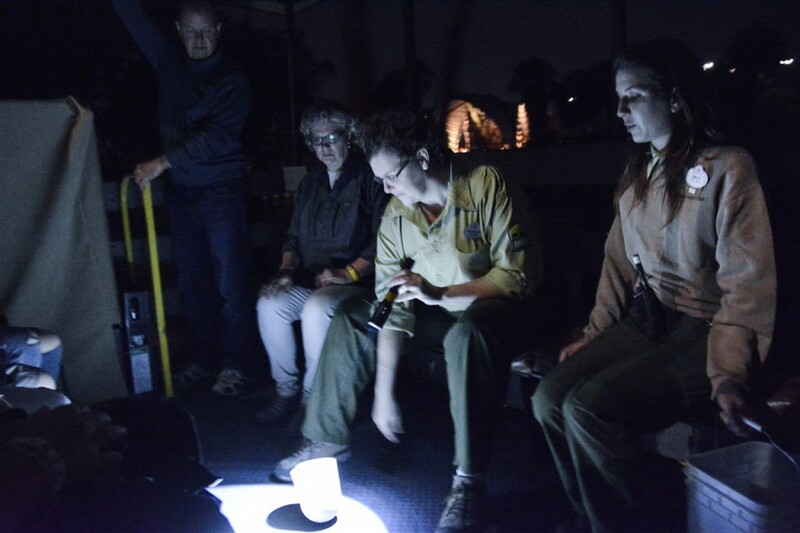 Once we were underway, our guides began giving us all kinds of information about the animals and the operations of the safari. I won’t go into detail here on what all they said , except to let you know they were very knowledgeable and happy to answer any and all of our questions. I’ll leave the details of that for you to discover on your own. One tip I do have is to be sure to bring along a jacket or sweater, even if it feels warm. Once that truck starts moving through the night air, it gets pretty chilly on board. At the beginning of the trip, we passed by a couple different barns. 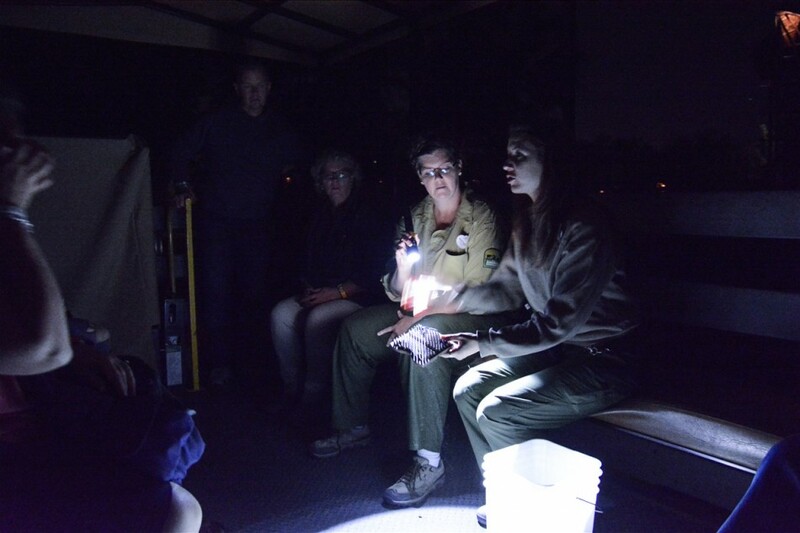 We stopped for a moment while our guides took time to explain what they were used for. 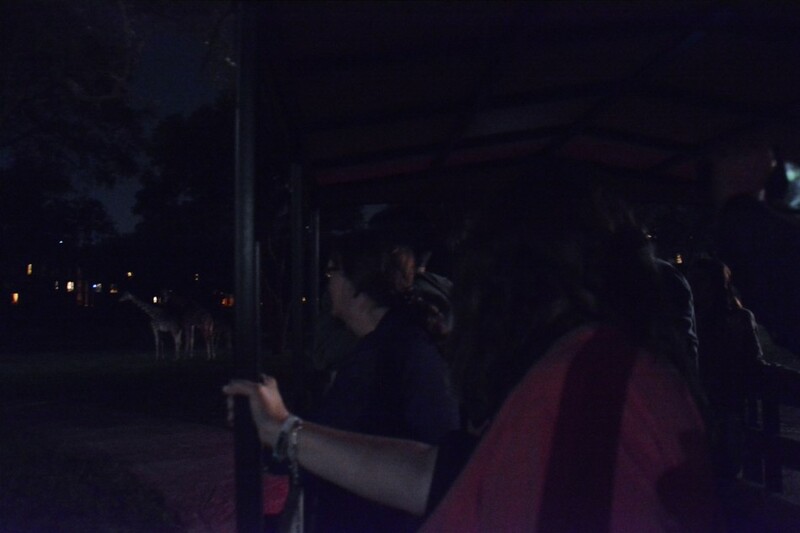 Then it was onto the safari! 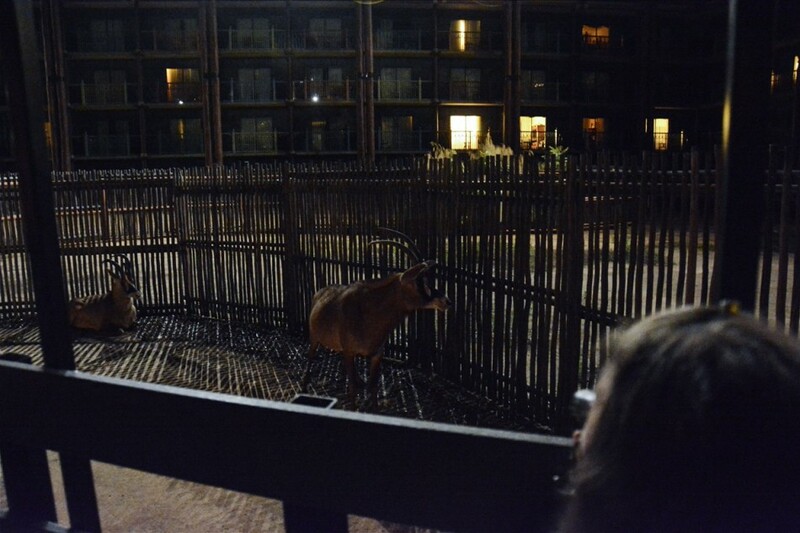 The first thing we saw was Kidani, all lit up. 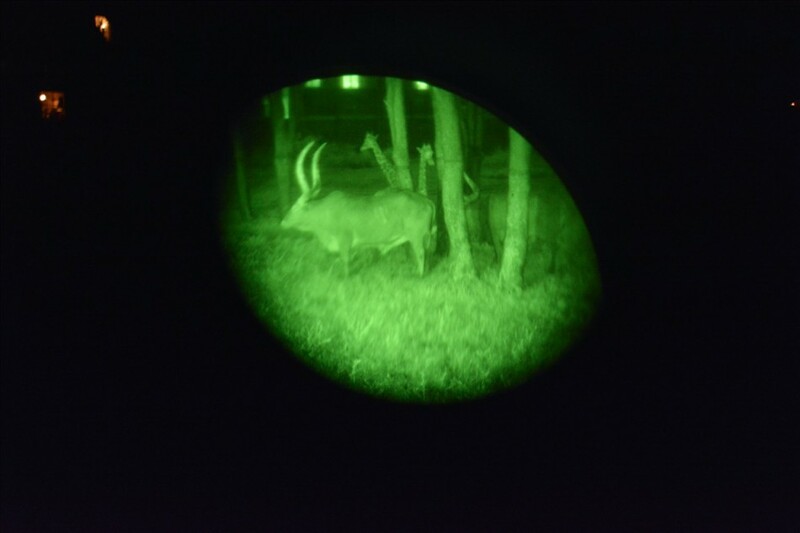 It looked so beautiful – what a treat to see it from the perspective of the animals. 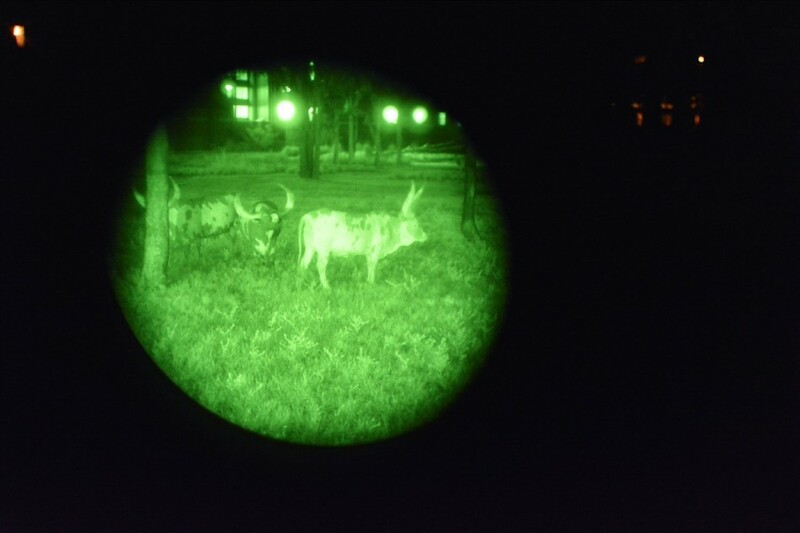 It didn’t take but a minute for our eyes to adjust and begin making out the forms of animals in the darkness. Just a note of caution… As I mentioned earlier, this is a very bumpy ride at times. You can stand up, sit or kneel on the benches but do be careful to hold on all the time. There are big potholes that seem to appear out of nowhere, right when you decide to let go – to take a picture for instance! 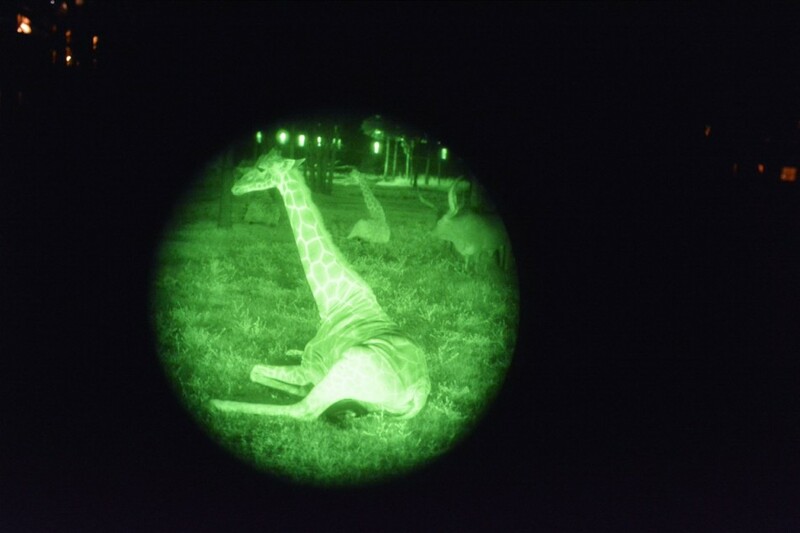 A very cool feature of this safari is being able to look at the animals through night vision goggles. Each party gets one goggle to share among the group. 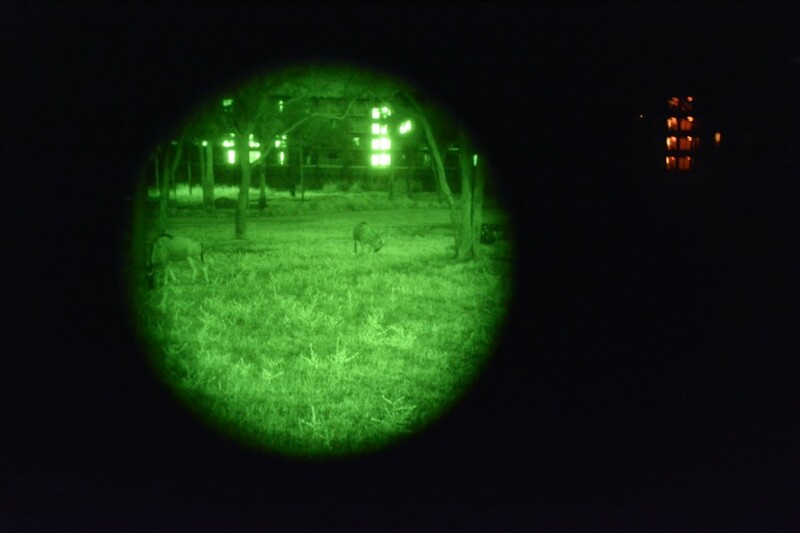 They were very easy to use and much clearer and brighter than I had imagined. 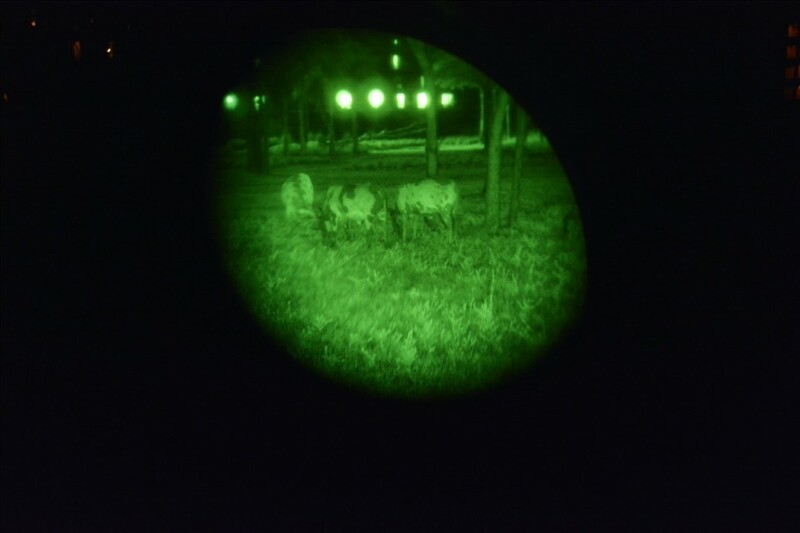 I held them up to the lens on my camera to give you an idea of what you can see with them. 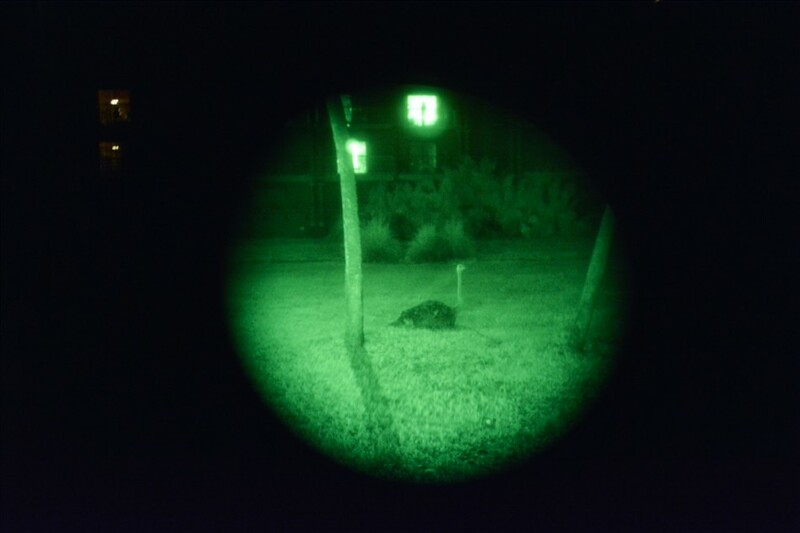 These pictures are a little darker than how it actually appeared when I looked through them. At a few different stops, our guides showed us some interesting items. Here we are examining horns from different animals. They explained how the horns differed from each other and passed them around for everyone to feel. I was surprised at the weight of them. Kidani is such a beautiful resort! Here was another stop and learning moment. 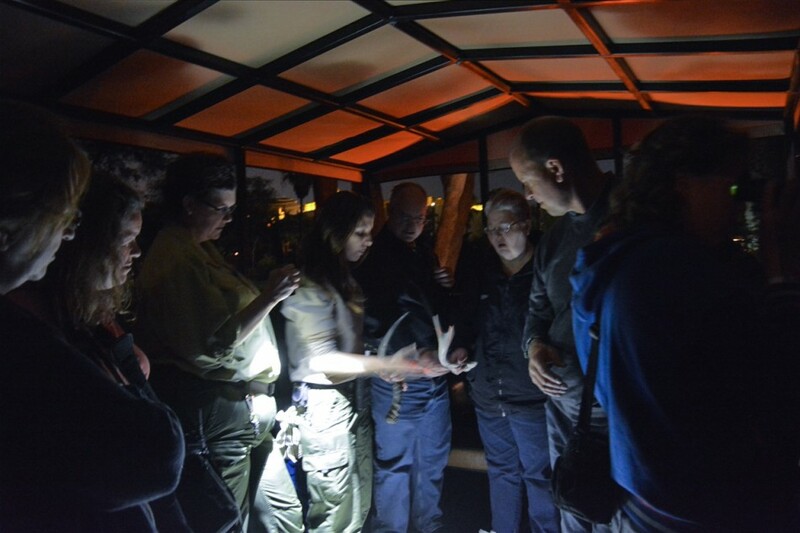 We were shown “toys” designed to keep the animals active and inquisitive. After an hour had passed – which really seemed more like 20 minutes! 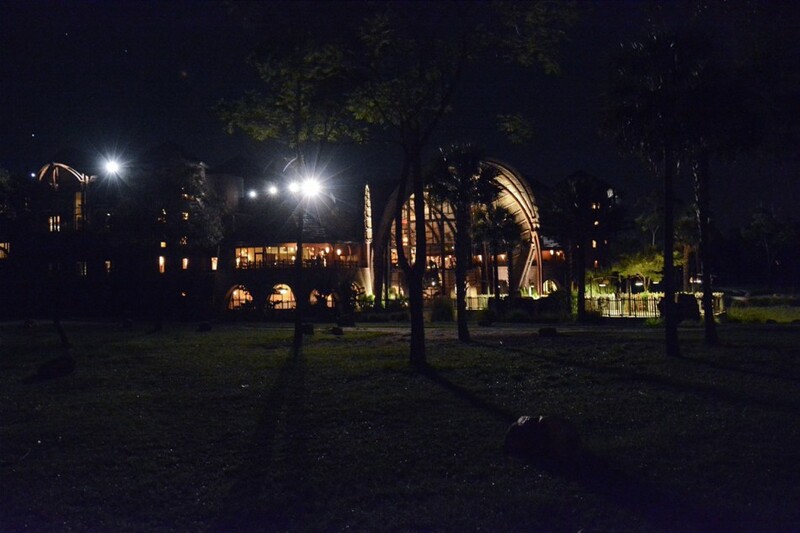 – we returned to the front of Kidani. 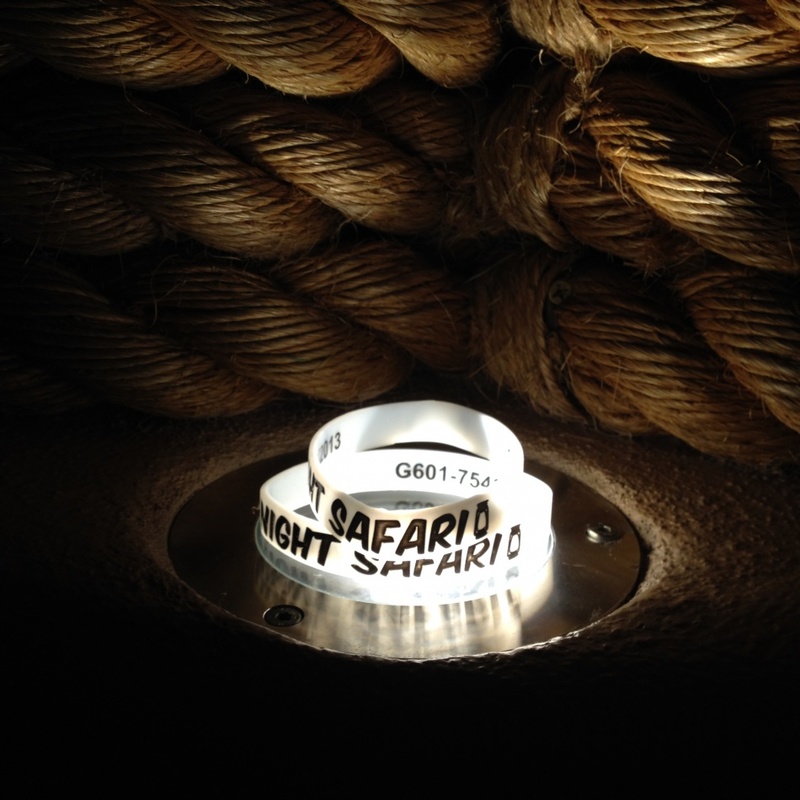 We each received a glow-in-the-dark conservation button and were told that a prtion of our safari fee would be donated to the fund. 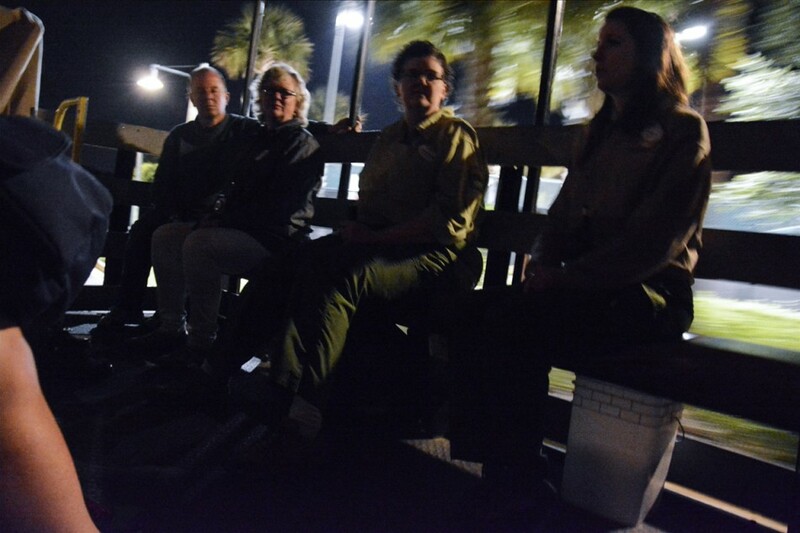 A shuttle was waiting to take those of us who needed a ride back to Jambo House. 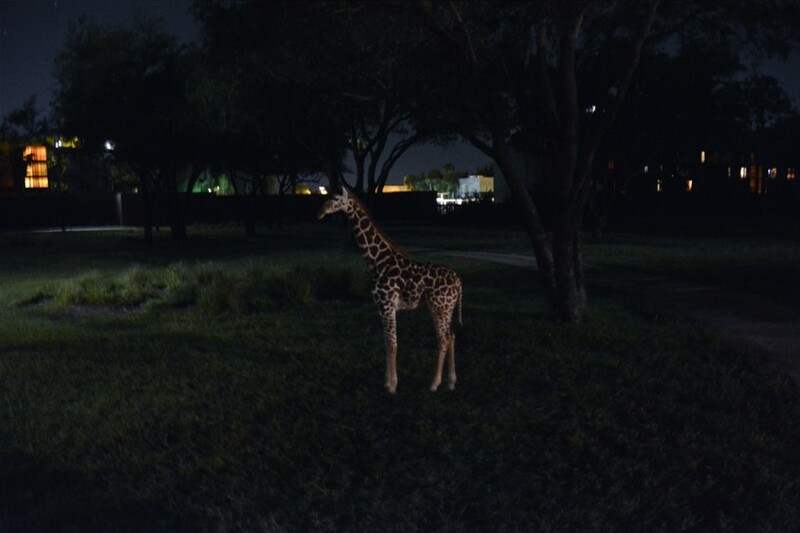 I really enjoyed this safari. It was different from anything else I’ve done at Walt Disney World. I wish that it was longer though! If you think this is something you’d like to try, here are some additional details for booking. 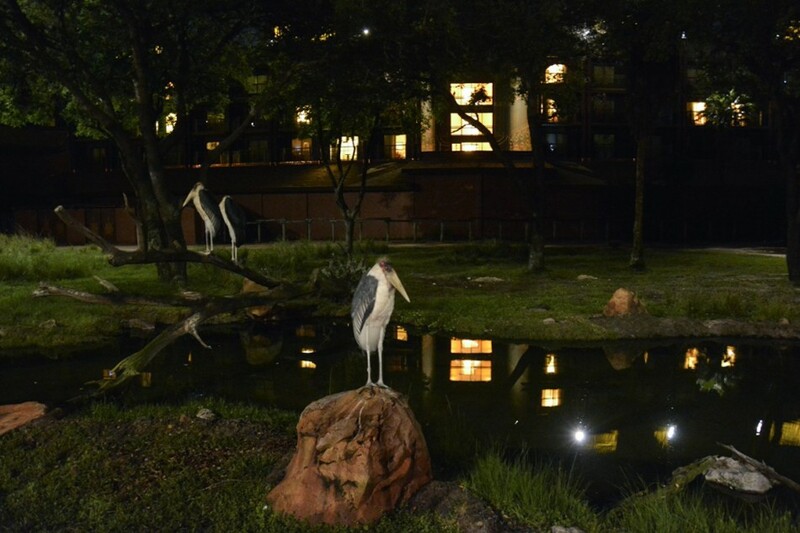 Night Safari is available only to Guests of Disney’s Animal Kingdom Lodge, as well as Disney’s Animal Kingdom Villas – Jambo House and Kidani Village—Wednesday through Monday, 10:00 PM to 11:00 PM. Guests must be at least 8 years of age to take part; Guests under 18 years of age must be accompanied by an adult participant. A valid photo ID will be required to check in. The cost of the tour is $70.00, plus tax. There are no discounts available. Full payment is due upon the creation of your reservation. (Payment is a credit card hold with a 48-hour cancellation policy.) You have to call Itinerary Planning, not the regular tour number: 407-938-4755, press 2 (it mentions Sunrise and Waynama on the message, but not this one yet). All aspects of the tour are subject to change without notice. Here is a link to Disney’s info page for the tour.